Can Antibiotics Cure Dog Eye Stains? If you have not read our series of articles about the major causes of Maltese eye stain, please read these first to get to understand the source of the problem. Once you know what is causing your dog eye stains, it will be easier to find the perfect solution. These solutions work well for Maltese that have health problems such as excess tearing, dog allergies, or dog ear infections. What dog eye stains solution worked for your Maltese dog? Tell us about it. Using antibiotics to reduce or eliminate dog tear staining is a controversial subject in the Maltese community. Some people think that antibiotics should only be used for medical reasons. 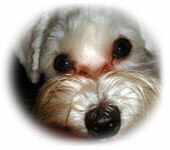 Other Maltese lovers believe antibiotics are a safe way to treat cronic eye stain. Most antibiotics require a prescription from your veterinarian. Please consult your vet before using any of these antibiotics to treat your Maltese eye stain. One way of eliminating tear staining is putting your Maltese on a ten day course of low dose chlortetracycline or Tetracycline . This antibiotic works by treating any yeast or baterial infections your Maltese may have. Do not use Tetracycline in puppies that have not yet cut their adult teeth. It can permanently stain them yellow. If your Maltese is not responding to Tetracycline you can try Lincocin . This antibiotic is similar to tetracycline. A the brand name for tylosin , this antibiotic is used primarily to treat respiratory disease and has anti-inflammatory properties. Many Maltese dog owners have found that this product can also have some beneficial effect in controlling dog eye stains. This is an anti-diarrhea medicine commonly used in dogs to treat yeast infections causing irritable bowel syndrome. Metronidazole can also be very effective in the treatment of dog eye stains, particularly when the staining is the result of red yeast. Yeast infections in the ears may also be a frequent culprit of Maltese tear stain. This generally responds well to Otomax ointment for dogs . Still have questions about dog eye stains? I've teamed up with a group of expert dog vets to help you find the answer.